Here's a wrap of April marketing news from around the world! 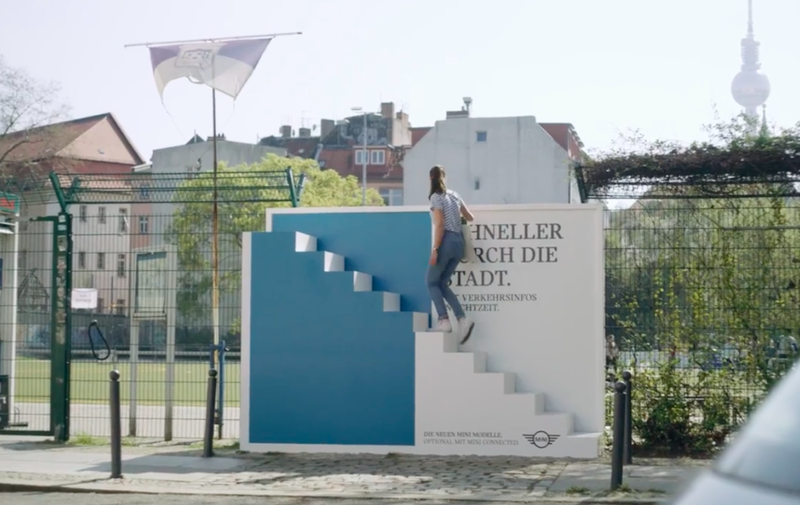 MINI promotes its 'real time traffic information' feature in its cars by pushing a number of outdoor ads placed in various spots of Berlin. The campaign aims to provide easy access to shortcuts throughout the city. Agency Serviceplan Campaign X fitted doors, ladders and windows to billboards, inviting pedestrians to take the proposed alternative route, with the campaign tagline: "Faster through the city with Mini Connected". Some billboards have a staircase over a wall, while others have tunnel passage under a railway line. Hans-Peter Sporer, managing director of creation a Serviceplan Campaign X, explains: "The idea of the shortcut posters is an original translation of the RTTI feature, which always has the fastest way through traffic ready, into people's analog world." Watch the video of MINI's creative outdoor ad here. Amazon's advertising business growth is now adding billions of dollars to Amazon's quarterly sales and continues to grow. According to Digiday, the e-commerce company reported in its first-quarter of 2018 filing that 'other' revenue - which it said "primarily includes sales of advertising services" - grew 132 percent year over year to reach $2 billion. Media buyers have reported the company has been running a series of attribution tests to see how its advertising stacks up against the Facebook-Google duopoly and that it’s also been testing application programming interfaces for the Amazon Advertising Platform with a small group of agencies, as it plans to let marketers manage their programmatic campaigns on their own. Early this May Snapchat will be testing a new six-second unskippable video ad format, called "Commercials", in the mission to generate more revenue, while preventing users from defecting to other platforms. The new ad form will run during a select number of the platform's Shows, but not in personal stories or the Discover news section. People familiar with the test told the publication that the move is an attempt to see how many ads users will tolerate. Commercials is expected to consist of high-quality ads from major companies, probably with the heavy price tag. Ford Motor Co announces its plan to cut costs and boost profit margins quickly, by dropping the unpopular traditional sedan models in North America. Ford's chief executive Jim Hackett told investors that the motor company is undergoing "a profound refocus" of its operations and may exit unprofitable businesses. The demand for traditional cars are shifting, due to changes in consumer preference. Responding to the shift of the high demand of SUV and pickup vehicles, Ford said it planned to trim its North American car portfolio to just two models: the Mustang and its compact crossover Focus. Ford said that eliminating most of the company's cars except for the two models will allow the auto brand to focus on their winning portfolio in the US, Canada and Mexico. For some analysts, Ford's move to remove sedan models was hailed decisive and necessary. YouTube will begin selling ads in its live TV stream, opening up more inventory in the streaming TV sector that can be highly targeted to specific consumers. The Google-owned video giant is making it possible for advertisers to buy YouTube video ads on TV screen only, acknowledging a shift in video consumption to the more traditional medium. According to Forbes, the move is based on new data by Nielsen that showed that more than half of 18-49 year olds barely watch or do not pay for television, however 90% watch YouTube. Furthermore internal YouTube analytics have further revealed that more people are actually consuming online videos not on their smartphones, tablets or laptop but on television screens, using video game consoles, smart TVs and more. McDonalds has turned menu items like burgers, fries, ice-cream and coffee into weather forecast icons in an weather activated outdoor campaign in the UK. The campaign is fed in real-time data from the Met Office. A ketchup soaked fry becomes a thermometer, a burger half-covered with a wrapper in a sun and cloud, a packet of fries is a rain cloud. All up there are eight different icons to show how volatile April weather can be and the posters include five-day forecasts, as well as the current weather.